Credit union people from throughout Southern California discussed the power of partnerships and Hispanic outreach efforts at the April 17 Juntos Avanzamos Regional Roundtable held at Ventura County CU’s Thousand Oaks branch. 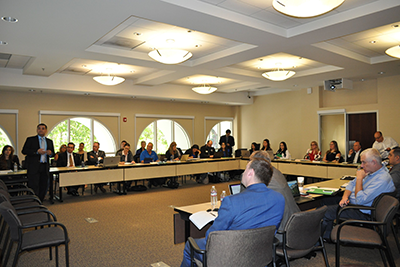 The power of partnerships was the overarching theme of a Juntos Avanzamos Regional Roundtable held April 17 at Ventura County CU’s Thousand Oaks branch. Attendees from various Southern California credit unions, including Altura CU, Gain FCU, Premier America CU, SCE FCU, and USC CU took part in discussions on how to work together to reach out to to Hispanic communities. Also in attendance were represenatives from Downey FCU, which the following day, held a proclamation ceremony for becoming the 10th active credit union in California designated as a Juntos Avanzamos ("Together We Advance") organization. Inclusiv SVP of Membership and Network Engagement Pablo DeFilippi, Ventura County CU CEO Joseph Schroeder, Rita Fillingane, VP, Research & Collaboration, California and Nevada Credit Union Leagues and Victor Corro, Chief Executive Officer, Coopera Consulting welcome everyone to the Roundtable. The event’s speakers included Deputy Consul Jonathan Elías Álvarez Alzua of the Mexican Consulate’s office in Oxnard and Ventura County CU Community Outreach Officer Cynthia Romo who discussed strategies to build effective partnerships and how they can help leverage resources and increase impact. Alvarez Alzua spoke on the Consulate’s Window of Finance (Ventanilla Financiera), which has provided financial awareness and information among Mexican nationals and Hispanic-Americans. For the past few years, the Oxnard office of the Consulate has worked with Ventura County CU, which provides free financial education to those who come to the Consulate. As Inclusiv's Pablo DeFilippi looks on, Deputy Mexican Consul Jonathan Elías Álvarez Alzua and Ventura County CU's Cynthia Romo discuss how to build effective partnerships. Alvarez Alzua said there are guidelines for those who want to partner with the Consulate: the organization or business must agree not to sell services and must be able to meet the needs of the region’s demographics. Corro made the case for developing a Hispanic growth strategy, discussing the components of a strong strategy, measurement tracking tools, and methods to identify gaps and opportunities. “You need to integrate your strategy within your entire credit union or else it will not work,” he said. Ventura County Community Development Corporation Director of Lending Services Alex Vega briefly spoke about how his corporation works with various businesses, including credit unions, to help increase homeownership within the Hispanic community. He said nonprofits are not always aware that credit unions can serve as a great resource for them. It’s important to reach out to them, he added. Univision Communications Inc, the leading multimedia company serving Hispanic America, offers what has now become an annual financial education summit that attracts some 5,000 people, said Community Empowerment Director Mayola Delgado. And Business Development Director Jim Coronado presented some insights regarding the Hispanic market. For example, the group has a $2.1 trillion in purchasing power and some 637,000 Hispanics in the Los Angeles area are credit union members. In addition, 63 percent of Hispanics have a banking relationship; 14 percent of all banking users are Hispanic and 4.3 million have acquired a new financial product in the last 12 months. Representatives from Square offered a presentation and there was a discussion on GPS tracking information. The Roundtable concluded with a panel discussion with Premier America CU VP of Community and Business Development Diana Cervantes, SCE FCU Chief Lending Officer Kitty Hunter, and Ventura County CU Branch Manager Arturo Zaragoza, Branch Manager sharing on community inclusivity. Richard Cooper, former CEO of Mendo Lake CU, served as moderator. Representatives from Downey FCU, the city of Downey, the California and Nevada Credit Union Leagues, and Inclusiv celebrated the credit union officially becoming a Juntos Avanzamos-designated organization. A day after the Roundtable, representatives from Downey FCU, the city of Downey, the California and Nevada Credit Union Leagues, and Inclusiv celebrated the credit union officially becoming a Juntos Avanzamos-designated organization. During the short proclamation ceremony on April 18, Downey FCU CEO Ray Messler said the designation is just the beginning of its work within the community. Downey Councilman Alex Saab congratulated the credit union for its designation and outreach efforts in the community. He also presented Downey FCU with a special resolution from the city of Downey to commemorate the occasion. The city of Downey presented Downey FCU with a resolution commemorating the credit union's Juntos Avanzamos designation. Credit unions across the state with this special designation now serve more than 800,000 members through more than 110 branches.